Panna cotta needs no introduction, unless you’ve been on the moon for the past fifteen years. Like the other Italian dessert, panna cotta has a relatively short history, it being generally accepted that it has its origins in early twentieth-century Piemonte. However, that still makes it more than twice as old as tiramisù, which is not much older than me. Despite its apparent simplicity—plain panna cotta takes about 15 minutes minus setting time—it’s very easy to get wrong, particularly if you add too much gelatine. Panna cotta should have a just-set consistency. If the spoon makes a squelching noise when cutting into it, there’s too much. You often see recipes for ‘light’ panna cotta incorporating milk but for the purists (i.e. most Italians) the clue is in the name: PANNA cotta meaning cooked CREAM. The cooking is pretty cursory as you don’t want it to reduce during boiling since that would make it too heavy. Am I making it sound hard now? Tuscan cows make Tuscan cream. For this version I have flavoured the panna cotta with crystallized ginger (the kind covered in sugar). If your ginger doesn’t have sugar, up the sugar quantity to 5 tablespoons. You don’t want the cream too sweet in order to balance the orange syrup. Panna cotta is amazing with fruit of any kind and in fact you could adapt this recipe according to what is available. I chose blood oranges as they were in the market and looked so attractive. Much prized, arancia rossa di Sicilia (Sicilian blood orange) has its own protected status. So here’s the recipe. Buon appetito! 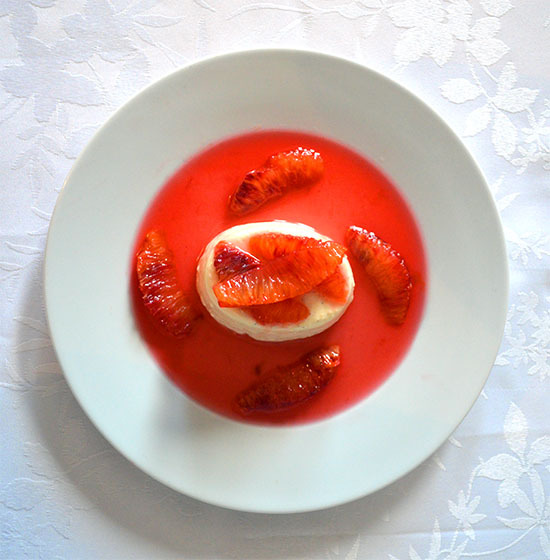 Panna cotta with ginger and blood orange. Soak the gelatine leaves in cold water for ten minutes. Slice the vanilla pod in two and use a knife to remove the grains. Add the vanilla pod and ginger to the cream and then bring to the boil. Leave to cool and infuse for 15 minutes. Remove the vanilla pod and then blend the mixture with a hand blender. Add the sugar and bring back to the boil. As soon as bubbles start to appear remove from the heat and add the gelatine. Whisk to dissolve. Pass the mixture through a sieve and then place in moulds and refrigerate for at least four hours until set. Cut the two blood oranges into segments. Put the sugar, water, orange juice, and cloves into a saucepan and bring to the boil, stirring to dissolve the sugar. Turn the heat down, and simmer until the liquid is reduced by half, about 15 minutes. Leave the liquid to cool for 15 minutes and then strain. Pour the syrup over the orange segments and leave them to infuse until the panna cotta is ready to serve. Unmould the panna cotta and garnish with the orange segments and syrup. This looks absolutely amazing. The colours are so vibrant I love it. Thanks! Yes, the blood orange juice was so colourful it really made the dish. Using Agar Agar instead of gelatine is even harder to get the right consistency – either doesn’t set or is like a rubber ball, but if I can find some blood oranges as gorgeous as these I’ll give it a bash. Am sure it won’t look as pretty as your though! Post pictures if you do and good luck! You have made a delicious pannacotta. I love the idea of pairing it with blood orange. Grazie! Era una panna cotta buonissima. As you know, good ingredients are the key. We seem to have swapped countries, (even though I was born in Italy).There are some lovely things on your blog too. This looks so gorgeous and fresh! The flavours sound fantastic and the photographs are moutwatering as well. Love the new site! Thanks Lucy! It took me a little time to get up and running and delighted you like it. Such spectacular photos for a lush dessert! Citrus season is a favorite of mine.